Our 2016 Bliss Sauvignon Blanc received a wonderful review as one of the top Napa Valley Sauvignon Blancs from the 2016 vintage from the St Helena Star’s tasting panel. Blind tasting’s are always quite revealing! This wine is full of ripe peach, red apple and lemon citrus flavors, with a waft of white blossom perfume and a hint of ginger on a richly textured body. Robert Parker give a pleasing nod to the 2014 Cabernets. This may be the best set of scores, across the board, that we just received from The Wine Advocate (Robert Parker), for the 2014 Cabernets. While these wines won’t be released for another 9 months, its great to see the quality is already showing through. While 2011 was a difficult vintage in Napa Valley, it is great to see our 2011 Eminence Cabernet Sauvignon receive accolades from the St Helena Star’s tasting panel. Blind tasting’s are always quite revealing! Not to be outdone, James Suckling also gives great reviews to our 2013 Cabernet Sauvignons. Another set of wonderful reviews for the 2013 Cabernet Sauvignons. The back to back stellar vintages show through in these reviews. James Suckling reviews our 2012 Cabernet Sauvignons. We had a wonderful surprise when the reviews from James Suckling came out. Our 2012 Cabernet Sauvignons all reviews 92 or 93 points. Reviews are below. Great reviews for the 2013 Reds from The Wine Advocate. Robert Parker reviewed the 2013 reds, right after bottling. These wines will only get better with time. Even in their infancy the wines showed quite well. The Nittany Epicurean reviews the 2012 Amaryllis Spring Mountain Cabernet Sauvignon. Thanks Michael for taking the time to review another wine from Bougetz Cellars. Below is an except from his blog. The wine showed a dark ruby almost opaque color. Blackberry, mocha, cassis, vanilla, plum and oak could all be found on a deep and complex nose. Blackberry, black cherry, mocha, vanilla, oak and hints of eucalyptus followed on the palate with the mocha and eucalyptus emerging as the wine opened up. The wine exhibited good structure and length. Quite tannic, it could be cellared for 3-5 years. This wine would pair well with a seared New York Strip Steak or a hearty lamb stew. You can see the entire blog post/review here. Toast of the Coast Wine Competition is presented by the San Diego State Fair and is one of the premiere West Coast Wine Competitions. This year we entered the 2013 Bougetz Cellars The Cairn Sonoma Coast Pinot Noir and it won a gold medal for Under $40 Pinot Noir. It also won two additional awards, being selected the best Pinot Noir overall, as well as the Best Sonoma County Pinot Noir! We are very proud of our most recent release. 2012 was the first vintage in which we were able to get our wines in front of Robert Parker at the Wine Advocate. We were very excited to get great reviews on our wines. Below is the review for the Prominence. The 2012 Cabernet Sauvignon Prominence Reserve is the star of the trio of 2012 Bougetz Cellars releases. Made from a blend of the best barrels from the estate’s Coombsville and Spring Mountain sources, it was aged in 100% new oak and exhibits an inky/purple color along with a sweet bouquet of blackcurrants and spring flowers, powerful, ripe, rich flavors, and a long, concentrated, boisterous finish. This serious red wine should only get better over the next several years and last 15 years or more. 91pts R.P. Wine Enthusiast Rates the 2012 Eminence 90 Points and a Cellar Selection! 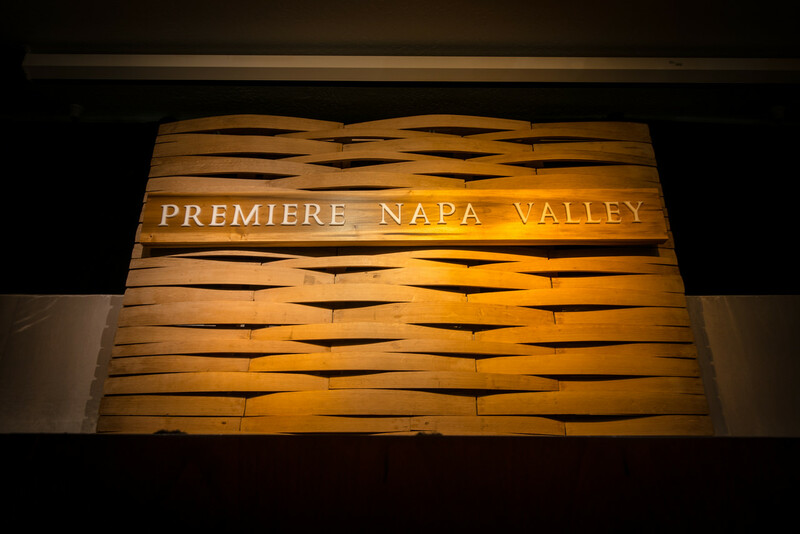 The 2012 Eminence Napa Valley Cabernet Sauvignon has been rated a Cellar Selection and received a 90 point rating from Wine Enthusiast in their recent review published in the November 2015 issue. Made from a majority of Cabernet Sauvignon, with small amounts of Merlot, Cabernet Franc and Malbec, this is a big, juicy wine with high acidity and a taste of crisp, red fruit. Substantial tannins suggest cellaring through 2018–2020 to elongate the young, puckering finish. –V.B. The annual grand tasting and futures auction, held at The Culinary Institute of America at Greystone, helps to fund our work to promote, protect and enhance the Napa Valley appellation. And wow, what an event! The morning barrel tasting session at the Culinary Institute of America was followed up by the auction. We want to congratulate Chan’s Wine World of Florida for getting the winning bid of $14,000.00 for the Bougetz Cellars lot! These specially crafted wine, besides its scarcity, will be a great example of Napa Valley mountain cabernet sauvignon! Bougetz Cellars introduces its wines to The Nittany Epicurean. Michael Chelus is known as the Nittnay Epicurean and we had the opportunity to get our wines in front of him. The first wine he reviews was the 2013 Rutherford Sauvignon Blanc. Below is an except from his blog. The wine showed a straw color. Tart apple, grapefruit, lime zest and slate arrived on the nose. Granny Smith apple, lime zest, grapefruit, slate and hints of dried apricot followed on a crisp palate. The wine exhibited good acidity and minerality, along with average structure and length. It would be a wonderful aperitif on a hot day or would do well paired with steamed mussels. Pairings – A Celebration of Food and Wine is presented by the Nashville Wine Auction which brings together top chefs from the greater Nashville area and pairs their dishes with premium wines from California. Bougetz Cellars is honored to be one of the featured wineries at this year’s event. The event is a two-day extravaganza in including two dinners, a silent and live auction, as well as consumer and trade tasting events. Throughout the two day event, we will be pouring our 2012 Sauvignon Blanc, 2012 The Cairn Pinot Noir, 2011 Eminence Cabernet Sauvignon and 2010 Amaryllis Cabernet Sauvignon. More information on the event can be found here. Our silk screen partner Monvera Glass does a video feature every once in a while highlighting something new and original in bottle design. See the video here highlighing the 2010 Amaryllis design. Wine Enthusiast Rates the 2012 Sauvignon Blanc as Editor’s Choice! The latest issue of Wine Enthusiast is out and we received the following review. Besides the excellent score, we received the Editor’s Choice designation for our Sauvignon Blanc. Lots of muscle in this punchy Sauvignon Blanc, with its ripe lemon, lime, orange and papaya flavors, made bright by crisp acidity. Despite a streak of honey, the finish is dry. Additional richness is provided by barrel fermentation and the addition of a little Sémillon. – S.H. Summer is here, and this is the perfect wine for heat of the summer. Wine Enthusiast Rates the 2010 Eminence 92 Points! The 2010 Eminence Napa Valley Cabernet Sauvignon received a 92 point rating from Wine Enthusiast in their recent review published in the April 2013 issue. This dry, complex Cabernet Sauvignon bears classic Napa tannins, plus layers of blackberry, black currant, violet, mineral and cedar flavors. The grapes were grown in the Coombsville area. Drink now, after decanting, and continue to drink it through 2016. –S.H. Drink up and enjoy. This wine is about gone. Our friends at Barrelly Conscious have crafted many lovely pieces of furniture and accessories out of retired wine barrels. 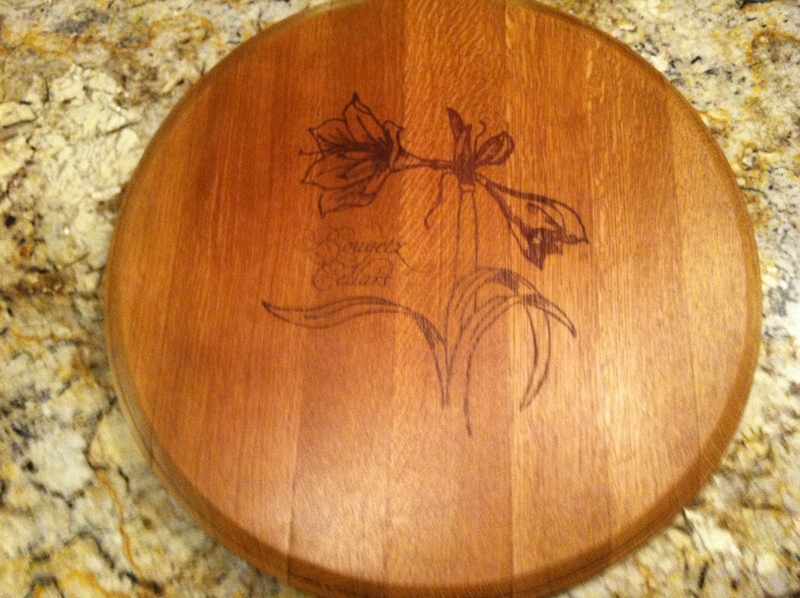 An example seen here is a beautiful lazy Susan with the 2010 Bougetz Cellars Amaryllis insignia burned into it. Check out other ideas for gifts for your wine loving friends who think they have everything. You can see more of the craftsmanship here. 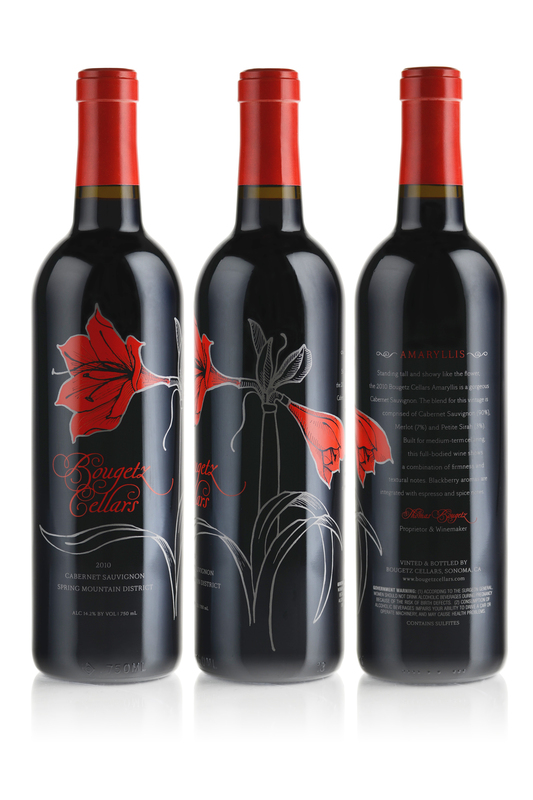 With the introduction of our newest Cabernet Sauvignon “Amaryllis”, we also have introduced a new design and are moving toward silk-screen packaging for all future bottled wines. The redesign, which was done by our longtime designer Jenny Doll (Jenny Doll Design), has received high praise. So much so, that Monvera Glass, our partner in silk-screening, featured the Amaryllis label design in a recent article in Wines & Vines showing the cool things you can do with this type of packaging. Take a look here to see our label presented in all its glory. You can read the entire article on etching and silk-screening here. James Suckling Rates the 2008 Eminence 91 Points! We were lucky enough to get our 2008 Eminence Napa Valley Cabernet Sauvignon in front of James Suckling when he was in Napa tasting through the 2008 Cabernet Sauvignon vintage. This was our first time in front of him, and tasting blind we received a very nice review..
Our first vintage of Pinot Noir, we sourced the fruit out of Brosseau Vineyard in the Chalone AVA, near Monterey. The Prince of Pinot, who writes the wine column PinotFile was at our facility and tasted through many producer’s 2009 wines. We received the following write-up in his report.